A rally against racism, in solidarity with Charlottesville, was held Wednesday evening in front of the Consulate General of the U.S. in Quebec City. A rally against racism, in solidarity with Charlottesville, Virginia, was held Wednesday evening in front of the Consulate General of the U.S. in Quebec City. 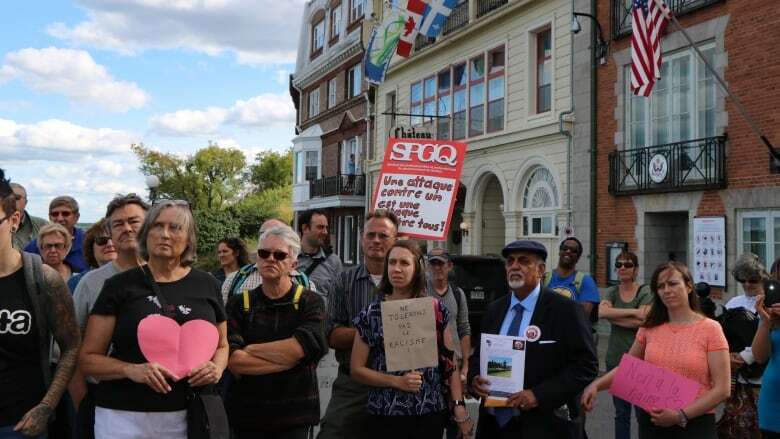 Several dozen people gathered in front of the consulate, which is at the heart of Old Quebec and steps away from the Château Frontenac, to say "no to hate and racism," a news release sent beforehand said. It's tourist season in Quebec City with many visiting from the United States and several Americans joined the crowd. They also said they didn't see themselves in the rhetoric of the white supremacists that demonstrated in Charlottesville last week. Pete Vunck said he watched in horror at what was happening. He is from Richmond, Virginia, an hour drive from Charlottesville. "We were very concerned by what's happening and overly concerned about how our supposed president is acting, and we're not happy with him at all, " said Vunck, who'd come with a group of fellow Americans whose tour guide told them about the rally. Linda James from Huntsville, Alabama, said she wanted to show her support to those fighting racism in the U.S., saying it "breaks our hearts and embarrasses us," and that what happened in Virginia "was just horrific and we're still trying to deal with that." A woman she was with carried a printed black and white picture of Heather Heyer, the 32-year-old woman who was killed when a car charged a crowd of counter protesters in Charlottesville Saturday. Organizer Jackie Smith said the rally's goal was in response to the Virginia demonstrations' "premeditated violence." "Whatever happens around us affects us. And we want a better, more equal, more loving society," she said. Smith added that Quebec wasn't immune to hate, pointing to the shooting at a Quebec City mosque just eight months ago that killed six men.